A message about money, luck or a good, unexpected turn in health. This is the kid who likes to make things. He/she is always playing in the mud with their truck, making sand castles, bringing home caterpillars and lizards and frogs. They like to hammer together bird houses, help build a tree house. And they’ll take it upon themselves to do extra chores for extra money. They’ll deliver papers, water lawns, walk pets. They’re very frugal with that money, keeping it in the piggy bank and counting it out often to see how much they’ve got. Personality wise, they may seem a bit too serious and sober for their age, a little too practical perhaps, though often generous and good hearted. I think I may have over-thought this card a bit too much. I knew what elements I wanted to incorporate but getting them to work together was harder than I anticipated. 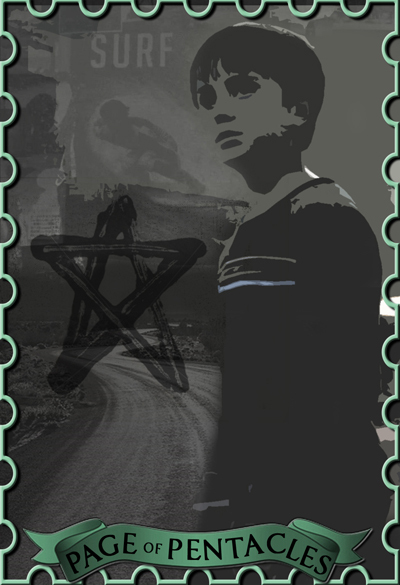 I wanted to use Jesse’s choice in leaving his parents to protect them as the main theme of the card. Jesse might be young but he makes adult choices and sticks with them. I bled the color out of the card to represent the black-and-white way Jesse sees the world.